Don Torino’s Life In the Meadowlands: Just a Red-Winged Blackbird? Many years ago I was on a bird walk with a group of people from a local nature center when suddenly a striking black bird with brilliant red markings shot by us like a Ferrari with wings. 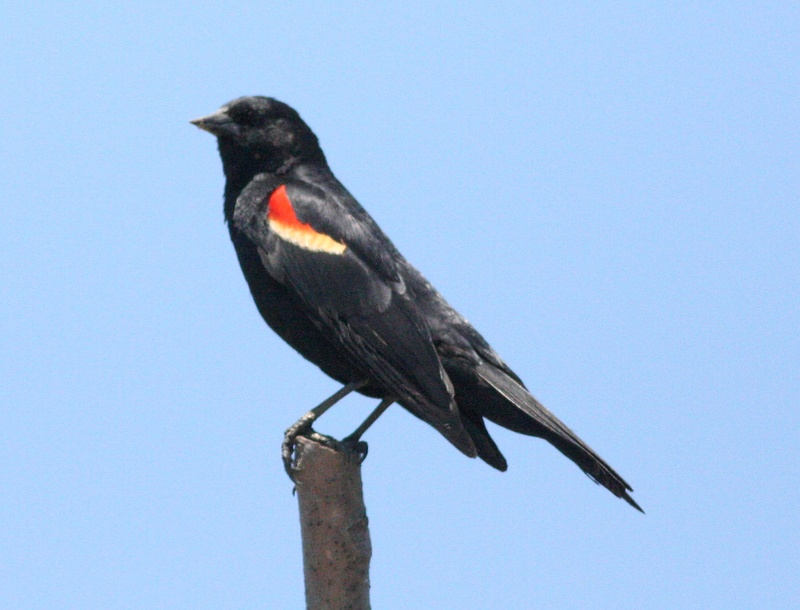 The leader barely looked up until someone asked, “what was that?” “Oh that?” the leader answered flippantly “Just a Red-Winged Blackbird.” Just a Red-Winged Blackbird? How could someone speak so offhandedly about such a magnificent bird that has meant so much to me ? Never mind that the leader failed to take a second or two to tell everyone about that wonderful bird in detail. “Just a Red-winged Blackbird”? Was I the only person who cared about the “Spirit of the Marsh,” as the Native Americans called it. I felt slighted in some way. After all The Red-Winged Blackbird is a special bird. Especially if you happened to grow up in the Meadowlands like I did. The Red-wing is one of the first birds that returns to its breeding ground in the Meadowlands in late winter. Beginning in February, we kids would watch closely out the school bus windows to see who could spot the first male Red-Wing clinging to the Phragmites, displaying his beautiful red epaulets for the world to see. A silent sigh of relief would come upon us once they successfully made their yearly return to the region. We knew no matter how bad the winter was, no matter what was going on in school or the world around us, spring was not far behind, and as a result things in one way or another would get better real soon. The Red-Wings were finally back! Years later I would continue the tradition of looking for the first Red-Winged Blackbird of spring when I drove my two boys to school. “There’s one! Right there!” I would exclaim. They would yell out from the back seat of the car. Sure enough, there it was, and all things were right in the world, at least for that day. The male Red-winged Blackbird is a cool-looking specimen. It has sleek black feathers highlighted by bright yellow and red chevrons. They are also big time philanderers, having sometimes 15 or more mates. The female looks nothing like the male and is often mistaken for a large sparrow. Male Red-winged Blackbirds ferociously defend their territories during the breeding season, chasing other males and anything else that may invade their personal space . Red-winged Blackbirds can be found in wetlands and nest around lakes, ponds and rivers, and of course all over the Meadowlands. Their song may not be equal to some other birds’ more musical calls of the forest, but I do adore their distinct sounds as they fills the air like a Spirit of the marshlands. Ernie Jardine, author of the book, “Bird Song Defined Decoded Describe,” talked to me about their call. “The Red-winged Blackbird’s sound is as readily recognizable as their rather distinct appearance,” Jardine said. “Most people know the harsh, raspy trill of the Red-winged Blackbird, usually pulsing forth from the reeds of a nearby marsh, or from a small tree overhead. “Often described as “CON-KA-REE”, each note higher than the last, it is this final higher trill that characterizes the song, louder, longer and more demonstrative than its sometimes squeaky, more abrupt introductory notes,” he said. A friend tells me that trying to choose your favorite bird is like trying to pick your favorite grandchild; it just can’t be done. But to this day when asked what my favorite bird is my answer always is still the Red-winged Blackbird. You can let me know what your favorite bird of the Meadowlands is, and maybe we can do a story about it. Drop me a line at Greatauk4@gmail.com.